If you want to buy a villa in Sardinia, please, don't hesitate to contact us. Ask even if you don't see here one you would like. We have more of them on our flexible offer. For sale near La Maddalena. Close to the beach. A lost paradise... built beyond reefs, wild olive trees and junipers a few steps from a silver white beach. Now for sale. For sale. Costa Smeralda. A place where elegance and well-being are at home. Elegant villa located in most striking Pevero Golf, the hill overlooking the whole coastline of the bay of Costa Smeralda, certainly an unforgettable vista! Much privacy and relaxation are felt immediately on entering this charming abode, chic, tucked away hiding amongst a thick garden. The sophisticated elegance of this villa strikes the guests even more as the charm of Sardinian nature surrounds the villa: the sea, the sand the wind. Costa Smeralda. 12 bedrooms. Facing the sea. Art, glamour and wild natural beauty gather together at Villa Etoile – facing the sea one of the most precious examples of Mediterranean architecture – Sardinia at its very best. A villa skirting the sea in secluded location facing an amazing landscape and one of the last lighthouses on these still savage shores of Sardinia. Hiding between sculptured granite rocks, small deserted coves with water clear as a pool. Villa Il Faro (The Light House) is set just on one of these. Silent and romantic the beach is just below tucked away behind granite rocks. From the villa you descend directly down to the sand. Private garden. Walk to beach. One of of the most romantic and luxurious villas in Sardinia, set just across from a white beach within most scenic, barren coastline. North West Coast. Porto Cervo. Heated infinity pool. 6 master suites. Enclosed grounds with alarm system and 24 hrs security. One of the most prestigious villas of the Costa Smeralda overlooking the Archipelago della Maddalena. The villa boasts a fragrant Mediterranean garden and a flow-through extra-large swimming pool that coupled with large floor to ceiling windows infuses a sensation of infinity between interior and exterior. For sale luxury villa on the beach. 40 km from Cagliari. South-Sardinia. An unique opportunity to purchase a sea skirting villa with beach access in beach location boasting a lot of privacy. A large sea skirting estate with garden. From the garden one can step onto the white soft sand. A villa with 8 bedrooms of very high standard welcoming and spacious. The living room with corner fire place leads onto the sea facing terrace. Old farmhouse for sale with attached barn, 400m from the sea boasting gorgeous sea views. A truly charming property for those who still dream of a bucolic life alongside Sardinia’s wild coastline. For sale an unique villa with private jetty on La Maddalena Island. North Sardinia. From the villa's garden one steps onto the sand... and flat granite rocks the water transparent like a swimming pool. The villa has private mooring for small boats. 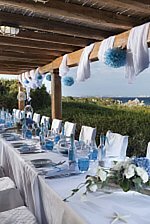 It is set in a very romantic, private corner of this amazing island which is part of Italy's precious natural heritage. We think the villa is truly unique it has a garden leading down to sea and an orchard. The interior design although in need of modernization has many artistic details art deco windows and an open space living room with charming corner fire place. The villa has a total of 7 bedrooms and 2 living rooms. There is also a mezzanine level for a double bed, this leads onto a roof terrace which has the most amazing views! The main living room has tall French windows opening onto the terrace the views from this side of the villa, will truly steal your breath away! For sale. South West Sardinia. Sleeps 16. Private swimming pool. A luxury villa in South West Sardinia with 15 metres long swimming pool. A secluded Mediterranean hideaway with stunning views over Sardinia’s most beautiful undiscovered beaches. La Maddalena Island. On the beach. Sleeps 10. Luxurious 5 bedrooms villa built on secluded sandy beach – a unique retreat on one of the most beautiful shores of the Mediterranean. Newly refurbished. Charming country home with 5 bedrooms plus 2 cottages, 1.5 hectares of land with typical Sardinia's plants, wine trellises and orchard. Large swimming pool. Grain fields, orchards and olive groves frame this large charming estate situated in a much sought after area of Alghero, consisting of a large villa with charming interiors and 2 smaller cottages built in the garden. South of Olbia. Sleeps 14. A short distance to a fashionable marina with sea side cafes. A large contemporary villa overlooking a coastline of protected white sprawling sandy beaches. The National Geographic mentioned this unspoiled Sardinian beaches to be amongst the most attractive of the Mediterranean. The villa is surrounded by a landscaped garden with large lawn, boasting a private swimming pool enclosed in teak surrounding. Alghero. 3 bedrooms, 2 batrooms. Garden with palm trees. Historic house for Sale in Alghero’s old town, situated in the most picturesque part of town, facing the open sea and the harbour. Some modernisation is needed. For sale. La Maddalena Island. Sleeps 8. Very short distance to beach. A private villa which will grant with its breath-taking views and its privacy a regenerating, relaxing holiday full of sea and sun. For Sale in Alghero (North-West Coast of Sardinia) striking villa within 1.5 hectares of land dotted with olive trees and junipers overlooking Alghero’s bay. Designed with the principles of feng shui in mind and fine-grained local materials joining forces to create harmony and beauty. Set amongst hectares of private Mediterranean park, bush and olive trees, Villa Aniada is unique in its setting and design which has translated in a modern style and using latest building procedures and materials the original style of a Sardinian abode. For sale. Porto Cervo, Costa Smeralda. A charming newly built villa, with breath-taking views. 4 bedrooms, 4 bathrooms. The villa is set in a peaceful position offering great amount of privacy and views to die for overlooking the bay of Costa Smeralda and the Golf Club. Tradition and contemporary style unite to create a dwelling designed with comfort and style in mind. For sale in Alghero. Sea facing villa consisting of two separate buildings for a total of 250 m2 with land. North West Sardinia. On the outskirts of the picturesque Catalan town, a property located right on the edge of the Mediterranean bush. A narrow path leads down to the open sea. This is a very peaceful spot, one can only hear the waves and the shrill of the seagulls. Located on a private road, the property is just the last one at the very end. Alghero. 4 bedrooms, 2 bathrooms. Swimming pool. Set within peaceful countryside. For sale in Alghero Villa Il Canneto. A modern villa within lush countryside close to Sardinia’s most picturesque and old coastal town Alghero. With its sandy beaches and still wild landscapes, Alghero leaves the visitors with every lasting memories. Its mild climate attracts more and more foreigners who purchase here their homes. For sale. A villa leading directly from the garden to a pearl white beach in a tucked away corner of Porto Cervo. Overlooking directly the sandy beach of the Piccolo Pevero, this charming semi-detached house offers several outdoor spaces to relax and enjoy the timeless atmosphere of this romantic corner of Porto Cervo hidden away behind vegetation. Opening the garden gate one can step directly onto the soft, pearl-white sand. Facing the sea the house is set in one of Alghero’s most picturesque squares. 4 bedrooms in need of much renovation work. Historic house in need of restoration in Old Town Alghero facing the sea, with one of the most spectacular terraces of the old citadel, who's charm continues to enchant the visitors all year long. For sale. Costa Smeralda. Ancient orchard with pomegranates and lemon trees. One hectare of land almost fully enclosed by the original stone wall, which also encloses a small pond as part of this private property. Sea side villa in South Sardinia. For sale. Private swimming pool and lush garden. Delightful villa for a large family with private swimming pool in villas resort with shared use of private beach. The villa is enveloped by private garden with palm trees creating a truly Mediterranean atmosphere. South East Sardinia, 50km to Cagliari Airport. North-west coast of Sardinia, near Porto Torres, Alghero. Sleeps 11+1. Large villa with ample seaview. Unique, picturesque location 80 m from a wonderful beach bordered by unspoilt, fragrant macchia. Alghero. 4 bedrooms, 2 bathrooms. Terrace, sea-view. For sale. Situated in the most sought after location in Alghero’s old town the villa faces the sea with views from the top terrace enveloping the whole bay and facing spectacular sun sets. Porto Rafael. Sardinia. A luxury villa with gorgeous sea views. Newly built within the typical Porto Rafael's natural surrounding of rounded granite rocks and Mediterranean macchia this luxury villa has unrestricted views of the bay below and much charm and privacy. Costa Smeralda. 3 bedrooms. Quiet area and great privacy. The villa is set in the prestigious location of Pevero Golf, a quiet area which enjoys great privacy and stunning sea views over the bay of Cala di Volpe. Designed by the famous architect Couelle in the typical Costa Smeralda style, the villa is plunged in a splendid private park with swimming pool and bbq area. Alghero. 2 bedrooms, 2 bathrooms, 100m2. Close to beach. For sale. Luxury Apartment in Old Town Alghero (Centro Storico). Fully refurbished to its rich exuberant original style short walk to sea. A real work of art and a most comfortable adobe to experience the essence of this ancient historic town unique in Sardinia ( 2 bedrooms, 2 bathrooms, 100m2). 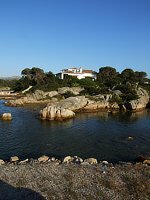 Villa with striking sea views in Porto Rafael, Costa Smeralda. For sale. A charming property with remarkable views and much privacy now for sale just outside the village of Porto Rafael. 4 bedrooms. Newly refurbished. New swimming pool. A newly refurbished barn overlooking the whole Bay of Cala Di Volpe set within the untamed nature of San Pantaleo and its red rugged granite canyons. Oristano area, Is Arutas beach. 5 bedrooms. Private pool. In a magical setting amongst dunes and sandy beaches, framed by a sea of transparent emerald color a few meters away from its garden, villa "Great Cape" is situated on the peninsula to the north of the Gulf of Oristano on Sardinia's west coast. Consisting of five bedrooms and three bathrooms, a large living room and a well- fitted and equipped kitchen, the villa boasts spacious rooms and a design inspired by the maritime surrounding. A large outdoor veranda on ground floor with shaded dining and lounging areas opens onto the swimming pool and the garden. Facing La Pelosa Beach. Stintino. For sale. Facing in the distance the silhouettes of Asinara National Park the most impenetrable of the Italy's maritime areas. 40 km to Alghero airport, the historic Catalan citadel at its door. A unique villa built with local slate typical of the cliff of Stintino. The villa is hidden within a garden of tall mature trees, palms and Mediterranean flowers. South West Sardinia. Sleeps 10. Cala Giunco. 300 m to long winding sandy beach with beach kiosk. Set within a private and gated park scattered with exclusive beach villas, Villa La Vela is surrounded by lush, manicured gardens, ensuring privacy in and around the house. 15 x 6 m swimming pool, spacious terraces and sheltered veranda. Sea views! If you are interested in purchasing any of these villas please contact us for further details.